We know little about Mr. Alexander Emrick Jones, but he sure does have a lot of oppositions and a grand trine in earth == moon to Pluto to mercury, telling us he is comfortable in physical world. His temperament type is a Locomotive with an open east side that tells us that no matter how he tries, he cannot manage to take control of his life, that causes him some amount of consternation has to rely on his Neptune 01 in Sagittarius (“the Grand Army of the Republic’s campfire”) making his career dependent on other people and their information. 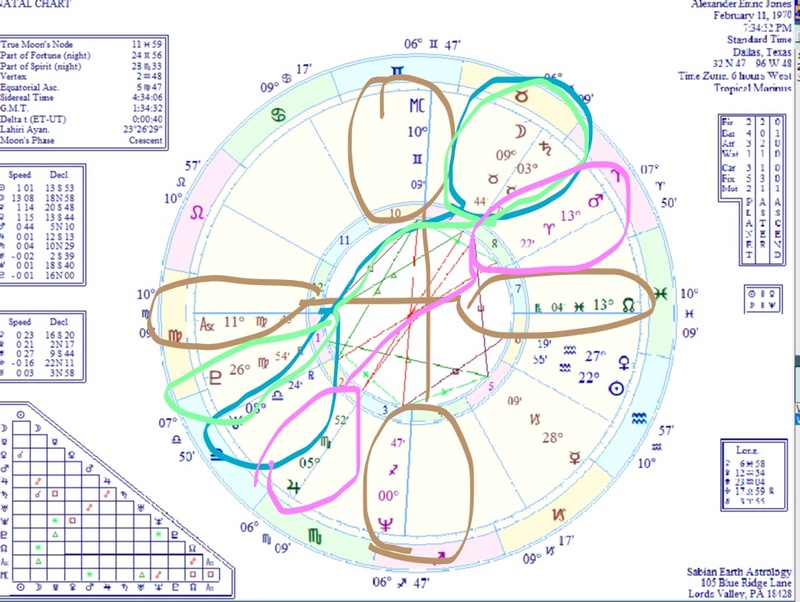 While we have no real time for Mr Jones, we feel that Virgo 11 (“a boy moulded in his mother’s aspiration for him” which maybe true as Demeter (an asteroid typially shown to represent the mother) is a semisextile away from his Ascendant and conjunct Uranus at 07 Libra) fits him well as he does seem to have a mutable personality — he is very people reliant and his Pluto in the first house endowing him with a magnetic & dramatic personality. His Uranus opposite the Moon makes him a lighting rod for issues he wants to understand and clarify by making them “hot buttons” and arousing people’s emotions. This is not an unusual ploy in journalism, historically it has been called yellow dog journalism as when the papers roused up the Republic and gave us the Spanish American War or on the radio “shock jock” radio for which Joe Pyne is credited with being the first. It’s actually comical, the stereotypes, the off colour jokes and wild insinuations that the audience enjoys and makes a byword or secret code but with their opponents always cry fowl. In New York City, Bob Grant single handedly destroyed Mario Cuomo’s career beyond New York State with a great Italian Salute in his March of the Gavones. He was too was taken off the air for a while, but eventually he came back, albeit on a different station. The New Yorker magazine gives the contra view here though they do half heartedly admit Grant was hilarious, but then his style changed over the years from the early 60’s and the Good Guys on WMCA to drive hour on WABC the then top radio station in America..
Back to Alex who with his InfoWars. His aggressive talk, Mars in the eighth opposite Uranus in the second, falls into that group which fits his most outrageous comment that Sandy Hook Connecticut was a put up job or his comment that Senator Cruz’s father was part of the Cuban mafia gang that killed Kennedy and then left conveniently for Canada where Teddy was born. Not much has been academically studied on the ascendancy of the shock jock which is rather unfortunate for like this article states “they have racist parodies, vulgar jokes, and outrageous political statements” that blur the boundaries of real and speculation, but with newspapers recounting that Jennifer Anniston is either pregnant or remarrying Brad Pitt is he alone? Is there a line where someone cannot go? and if so where does the First Amendment end and Orwell’s Big Brother begin. According to it, that line does not exist. Of course companies can create a line but that treads very closely to fascism. The First Amendment guarantees freedoms concerning religion, expression, assembly, and the right to petition. It forbids Congress from both promoting one religion over others and also restricting an individual’s religious practices. It guarantees freedom of expression by prohibiting Congress from restricting the press or the rights of individuals to speak freely. It also guarantees the right of citizens to assemble peaceably and to petition their government. ——– Cornell University Legal Institute. There are no bombs being thrown, no World Trade Towers being blown up or dubious marches being spearheaded. Instead it is a way of listeners blowing off steam and celebrating their particular rancor particularly as Big Business (Apple is now the richest company in history FWIW) is sanctimonious in claiming that they do not want to dirty their hands while using prison labour in China. That continues until they start losing money and then they just shut up. For Alex his method of outrage (Moon and Saturn in Taurus but in different houses) is so seemingly illogical (Saturn square Venus in Aquarius) that his opponents are thrown off for a response. That he has made lots of money doing it, also upsets his opponents. because everyone dollar he makes they feel is one they did not and his chart with Jupiter in the second house shows Jones is making buckyoo dollars and as it in Scorpio, there has to be some jealousy on that account. That idea is not as wild as one would suppose as it is supported by the transiting Ascendant of his Twitter post on August 10th only a SemiSextile away from the natal, & so highlighting an inauspicious association between the two i.e. take away his money you take away his voice. The Mercury-Sun conjunction in the sixth house support that idea as well, and there is no doubt, this is a watershed event in Jones’s career. 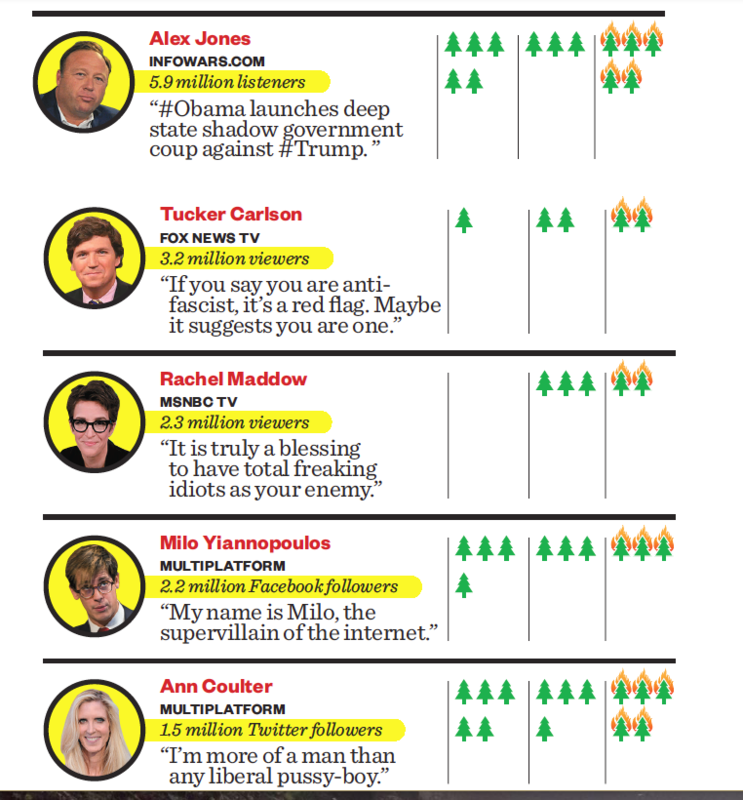 You can read about his competitors, it would seem we have done plenty of them, Laura Ingraham, Milo Yiannopolous and Rachel Maddow. Each one will tell you that the other is a fool, and if they have a good song, and you can dance to it, so much the better . We originally said that Jones was a Splash but have since corrected that to a lost Locomotive.